A star trail sequence of 390 images shows the path of the moon and the stars during the total lunar eclipse on Jan. 21, 2019. Miguel Claro is a professional photographer, author and science communicator based in Lisbon, Portugal, who creates spectacular images of the night sky. As a European Southern Observatory Photo Ambassador and member of The World At Night and the official astrophotographer of the Dark Sky Alqueva Reserve, he specializes in astronomical "Skyscapes" that connect both Earth and night sky. Join Miguel here as he takes us through his photograph "Lunar Eclipse Trails." 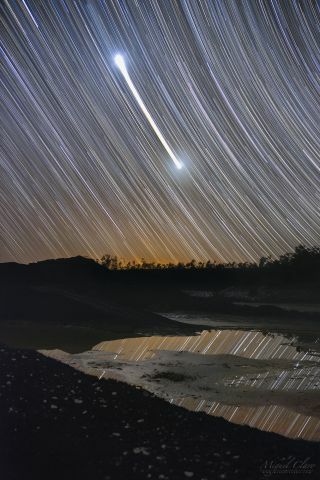 A star trail sequence of 390 images shows the moon's path across the sky during the Super Blood Wolf Moon of Jan. 21, 2019, as seen from Mina de São Domingos at the Dark Sky Alqueva Reserve in Mértola, Portugal. Because the moon was near the closest point to Earth in its elliptical orbit at the time of the eclipse, it was also called a "supermoon." Some stars are reflected in a small puddle of acid water at the old mine. To create this image, I used a Canon 5D Mark II DSLR camera set to capture a 13-second exposure for each of the 390 frames, with the ISO set to 1600. I used a 24-mm lens, set to f/2.